Filing in among the 22,000 sell-out crowd. A somewhat diverse group, agewise — festival headliners were R.E.M., The Cure, and The Flaming Lips, after all — but ethnically… well, not so very. College students, neo-hippies (the ones who weren’t at the Northwest Folklife Festival taking place the same weekend at Seattle Center), hipsters and yuppies seemed to comprise the major cliques, with a few music industry people thrown into the mix. The weather reports predicted rain on and off this weekend, but by 2PM, the sun was shining brightly, baking the Gorge in a summer-like heat. Josh Bis (science vs. romance) offers a terrific write-up of the festival’s first day on the KEXP blog along with plenty of photos taken from a much better vantage point than mine. As it turned out, he and I had almost identical concert schedules — impressive considering the 50+ acts on three stages over the two (of three) days I attended. 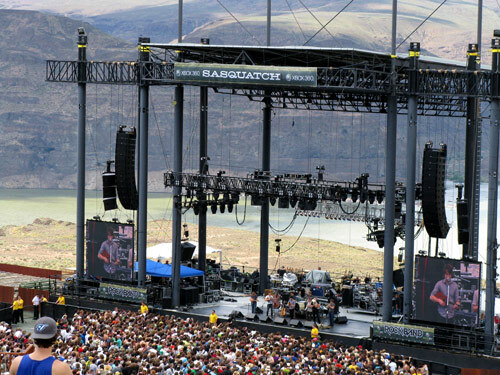 In roughly decreasing order of profile, performers played back-to-back on the Sasquatch! 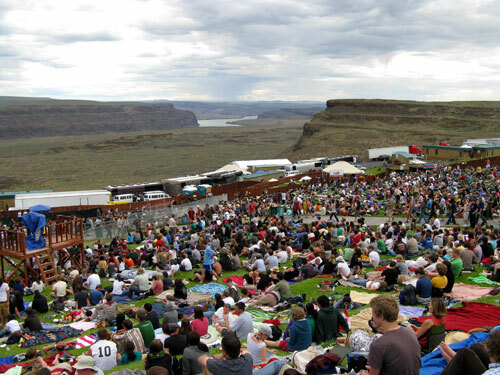 Main Stage, set directly in front of a stunning canyon/river backdrop, the Wookie! [sic] Stage in the meadow and the Yeti! Stage in the plaza, adjacent to the picnic tables. Up-and-coming Athens, Georgia trio The Whigs, who rocked it out at SXSW in March, were on tour promoting their second album “Mission Control (released on Dave Matthews’ label.) CF and I caught the last couple of songs of their energetic set as we made our rounds through the Gorge grounds, stopping for a pair of frozen lemonade slushies, which were absolute perfection on this bright, warm afternoon. We headed over to check it out and caught Canadian songstress Kathleen Edwards — hailed as “one of the most distinctive singer-songwriters to emerge in years” — playing a prettily earnest alt-country set, accompanying herself on violin. Rainn Wilson (The Office‘s Dwight Kurt Schrute), who was at the Festival promoting his upcoming film, The Rocker, had the unenviable task of announcing that The National would not be appearing due to a broken-down tour bus. Disappointed murmurs all around. 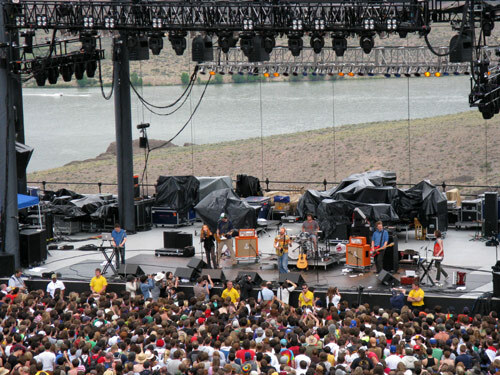 In their stead we had the capable Fleet Foxes, making their second appearance of the day after opening the main stage at noon. Then more Canadian action: The New Pornographers, who played a set culled heavily from “Challengers” and “Twin Cinema.” To our delight, Neko Case was up on stage; likewise Dan Bejar, whose other band Destroyer had just finished playing a Wookie! Stage set. The Pornos’ cover of ELO’s “Don’t Bring Me Down” was one of the best set-closers of the day. By the time M.I.A. came onto Sasquatch! stage, anticipation was high; Maya had to drop out of last year’s line-up due to visa issues, but overall, I was somewhat disappointed by this (very loud) set. All of which made the decision to skip out for a fried dough break all the easier. Mmm… elephant ears — so devoid of nutritional value, yet so utterly delicious. 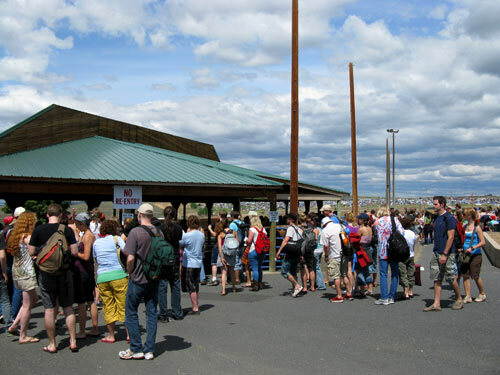 The flaky pancakes of fried dough, dusted with cinnamon or powdered sugar fresh from the deep fryer, were the culinary hit of the festival, judging by the near-constant line at the concession stands. Though had it not been for that line, we may not have gotten wind of the unannounced appearance by The National, who finally made it on site, and were given over the Yeti! stage to perform. Word of their impromptu concert spread wildly as fan Rainn Wilson good-naturedly roasted the boys from Brooklyn in his introduction, citing diva pique as their reason for failing to perform earlier. 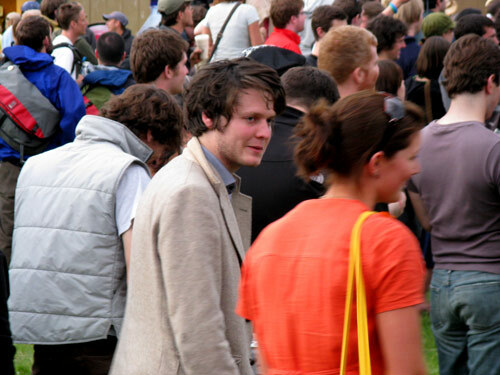 At one point Zach Condon (Beirut) wandered over, and I went into paparazzi mode. So much music, so little time. 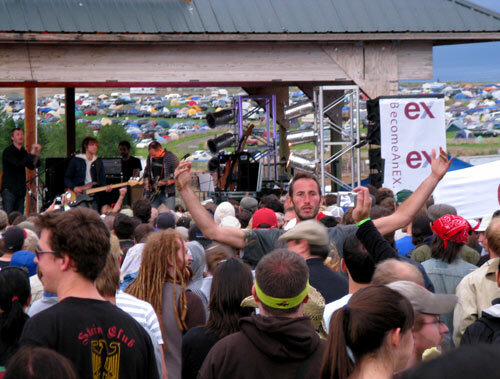 Riveted by lead singer Matt Berninger’s deep velvet voice, we ended up abandoning our plans to check out Austin’s Okkervil River — listen to the NPR piece about them here — before finally making our way to the Wookie! Stage to stake out spaces for The Breeders close-out set. 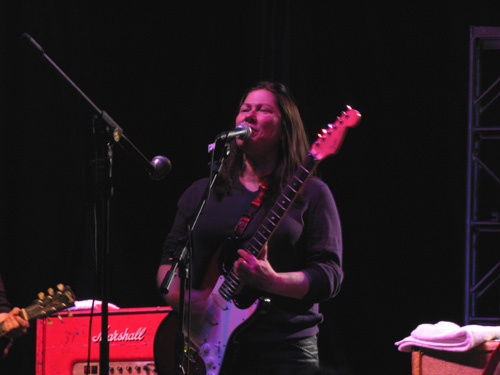 Yes, The Breeders! That set created probably our biggest dilemma of the evening: Modest Mouse was playing simultaneously, and though I had looked forward to catching former Smiths guitarist Johnny Marr, I could not pass up the rare opportunity to see Pixies bassist Kim Deal. 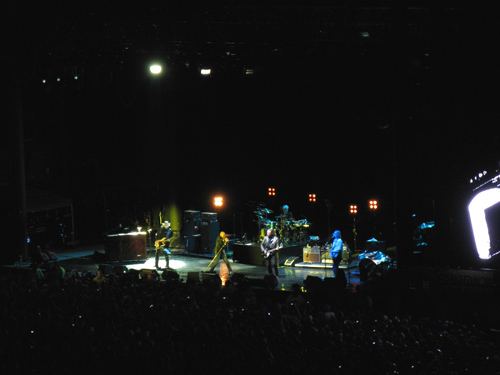 (And in fact, Modest Mouse will be opening for R.E.M with The National at Jones Beach in mid-June — tickets still available, $39.00-$1,098.00.) Truly an unexpected treat to see the Deal twins, whom we know have had their issues in the past, even as the cloud cover (which had been building since late afternoon) finally gave way to intermittent drizzling rain. “Cannonball” still rocks — 15(!) years later. We had to tear ourselves away from The Breeders show (where I’d wended my way through a gaggle of under-aged drinkers to within five feet of the stage) to catch the beginning of R.E.M.’s set. By then, the sopping chill had settled in — probably 30 degrees off the peak afternoon temps — and the hardy fans who remained huddled for warmth on the hill as Michael Stipe and Co. took to the rain-slicked stage. Calling out support to Barack Obama, and doffing his socks and shoes, a pinstripe-suited Stipe, backed ably by Peter Buck, proved the case for the band’s longevity, playing a tight, hard-driving set that successfully integrated new material with their early and late-era classics. “Drive,” “Losing My Religion,” and “The One I Love” invited audience sing-alongs as “Orange Crush” and “Man on the Moon” closed out the nearly two-hour set. OMG, that clip of Vince Mira really is amazing!